This is a great story and one to which I can relate. My grandfather “built” a synagogue that became part of my childhood. While it was in another city, it had special status because of him. The social hall was even named for him. Then in the mid 2000’s the congregation moved to the suburbs and the building became a Pentecostal church. At first I was crushed, but my feelings have reversed. Judaism does not hold synagogues (the buildings) as sacred – that’s a Christian concept we’ve adopted. It’s just a building. The sacred things are the people and the Torah. Yet we hang on with every fiber of our being to sustain buildings and not communities. The author comments, “After driving up that familiar steep hill, I was struck by the overtly welcoming vibe. Parking lot spaces were reserved for first-timers, and a team of greeters stood outside the building with welcome signs. In the lobby, the words “Welcome Home” were posted above the sanctuary’s wooden doors, now painted grey, above where the Torah rescued from the Holocaust had been. 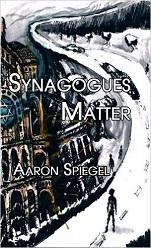 A newcomer table offered a free book…” I don’t know this synagogue but his surprise at the welcoming vibe is likely one of the reasons the community is no longer viable!